"The classic solo card game goes mobile"
There's a reason Solitaire, the classic card game for one, still comes installed on practically every PC ever produced. Its soothingly predictable challenge still manages to make you feel a sense of accomplishment every single time you play. 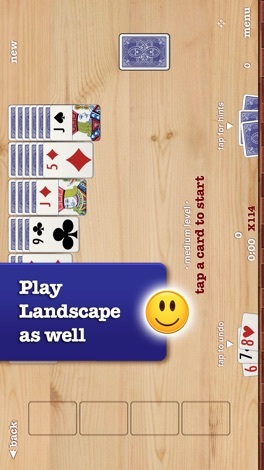 Finger Art's rendition of Solitaire into app format is completely successful, faithful in every way to the original, even providing a few extra touches that make the experience even better. You have the option of selecting between Easy, Medium, and Hard card spreads, with the caveat that the Hard ones may or may not be winnable. You can also choose to draw one or three cards at once. There's no option to go through the whole deck drawing just one card at a time, though - a pity; that's the one classic aspect missing from the app. 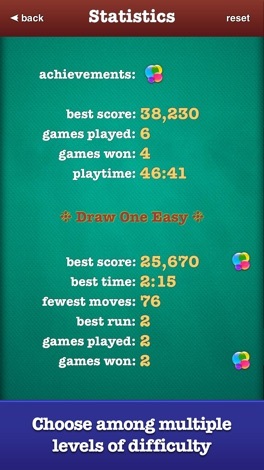 Gameplay is more than simple, following the classic rules of Solitaire. You can drag a card to its intended location; alternatively, tapping it will send it where the app guesses you'd like for it to go. Once you get all the cards on the board, you can autocomplete if you prefer - although I'd argue there's a certain satisfaction in tapping every card into place yourself. 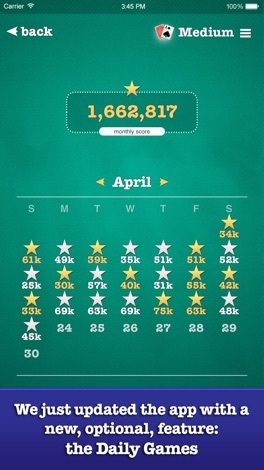 Stats regarding score and playtime are kept for you automatically each time you deal. The graphics are smooth and attractive, and there are a few choices of card/background color combinations you can select from. 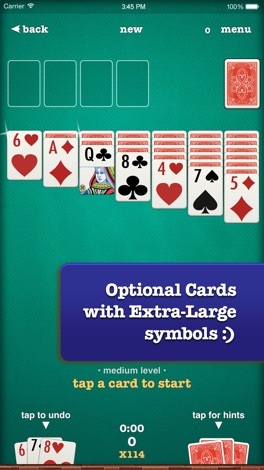 Although none of them are wild and crazy, that's fitting with the calming nature of Solitaire. Finger Art's Solitaire is excellent in that it perfectly replicates what's good about playing the simple, classic card game. You already know if you're a Solitaire fan - now you can take your solo card challenge on the go.